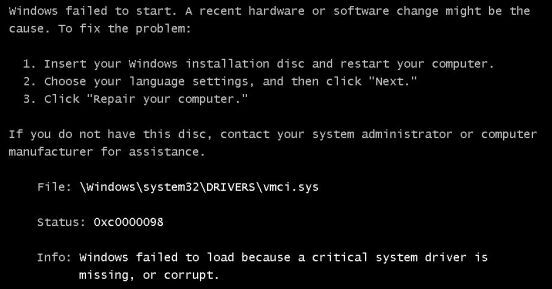 During the upgrade of the VMWare Tools the file \windows\system32\Drivers\vmci.sys was marked as corrupt. With the very unpleasant effects that it was not able to boot the virtual machine – neither in normal nor in safe mode. The solution in this case was to attach the virtual hard disk of the VM to a different virtual servers, and then replace the infected file vmci.sys. The file vmci.sys is the VMWare Virtual Machine Communication Interface (VMCI) driver. This is responsible for communication between the virtual machine and the host operating system or between two or more virtual machines on the same host. Four years later, but this really saved me. Thanks! 5 years later, worked for me! Thanks! 7 years later, it worked for me too! Thank you for this trick, it saved me! !